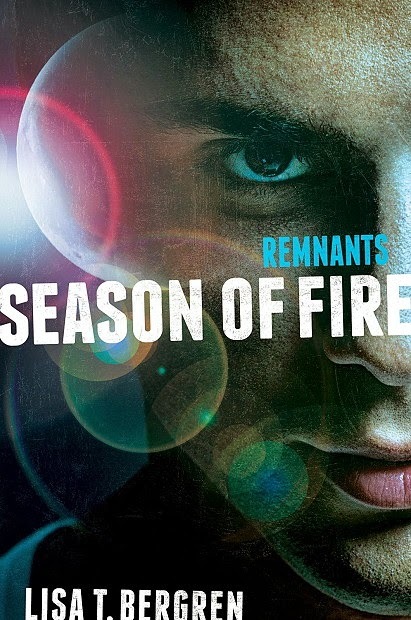 Season of Fire takes us back into the world of the Remnants. This book has a lot more focus on Keallach and getting to know the inner workings of Pacifica. The first book obviously focused on Dri because she is the main voice of the story but I felt like Season of Fire really focused on her a different way. Her struggle within herself to stay faithful to her cause and the maker. I thought it was really interesting she is Remnant and blantaly has a great calling but still gets faced with turning dark. She’s not inflable, that choosing to be part of the light is a choice. It’s hard for me to get out what exactly I mean but I thought it was a great message. I think Dri really developed and found herself learning that there are all kinds of different types of battles. It was really interesting getting to know Keallach and his world. You think of him as being this evil ruler and that’s it but he really becomes a multifaceted character. We see how the influence of Sethos and the Six really comes into play. I can’t really make up my mind about him. How much he really does and doesn’t know. Even though we have all this access to him, there is still a bit of a mystery. We do experience some new areas that we did not before. Pacifica is definitely a big one, of course the island and then along the river. The Remnants often have to separate and then find their way back to one another. Although the story is mostly told in Dri’s point of view. We sometimes get to see it from Ronan eyes. It rounds out the story. I really enjoy Lisa’s writing and her style of storytelling. I think the way she has woven a spiritual message but still makes the book have that fantasy feel is pretty cool too. Season of Fire is a great addition to the series and does not suffer from second book slump. It helps to put in place the elements that will lead to the final battle. Sweet or Salty? Mmm, both. Morning or Night? Middle of the day. Ebook or Print? Neither! Audio. Spring or Fall? Fall, baby. Typed or Handwritten? Letters? Handwritten. But even I rarely do that anymore. Manuscript? Typed. Blue or Green? Green. I read once that people favor the color closest to their own eye color. Action or Romance? Action. But with a heaping side of romance. Lisa T. Bergren is the best-selling, award-winning author of over 40 books, with more than 2.5 million copies sold. Her most recent works includes a YA series called River of Time (Waterfall, Cascade, Torrent, Bourne & Tributary), God Gave Us Angels, and the Grand Tour Series (Glamorous Illusions, Grave Consequences, and Glittering Promises). She’s currently at work on the third in her Remnants trilogy, coming out in 2016. Lisa’s time is split between managing home base, writing, and working on fence post ducks with her husband, Tim (RMrustic.com). They have three kids–Olivia (19), Emma (16) and Jack (11).